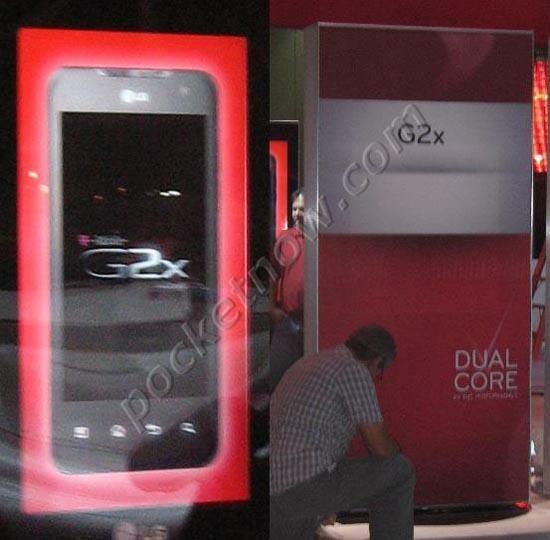 As expected the T-Mobile and LG are set to unveil by the T-Mobile G2X, the first dual-core phone for T-Mobile. We had a pretty good premonition that this would be taking place but with the above posters being set up around the LG booth as spotted by the Pocketnow.com folks. We expect T-Mobile to officially announce the device in the coming hours and get our own hands on tomorrow evening! ← HTC Pyramid Specs Hit The Inbox, Launching In June With Android 2.4? I was excited about this then the merger news killed all that. Still going to get this phone but I wander how will the merger affect its future. Better hope it has 850/1700/1900 HSPA+ bands. That will help. It doesn’t use those bands and I doubt they will change it this close to launch. Still be excited, it good when a woman gets excited about anything, lol. Anyway the merger wont affect your phone or your plan win Tmobile. There just going to be sharing the Tower Cells because At & t and Tmobile couldn’t do the coverage that covers all there customers combined. Get this phone if you like, but there is a HTC powerhouse coming out in May. Dual core processor, 4.3 screen front facing camera and extras that will give Tmobile a big thumbs up. You forgot Rule 29 of the Internet: On the internet, all girls are men, and all kids are undercover FBI agents. AT&T’s already admitted that if the merger goes through you will eventually have to replace your phone (because you’ll need to move to AT&T’s 3G frequencies). You make a good point, that even after the acquisition is approved it could still take a while for the transition to occur. WHAT THIS GUY SAID! PUT A STICKY ON IT! That’s not true, read the questions that have been answered about the merger and what will take effect. Your plans wont change and the phones will still work with what company you have now. You wont have to change phones! They are just going to be sharing Towers to give a more coverage basically because AT&T and Tmobile couldn’t do it on there own. I believe everything will work out, it will take a year anyway for the merger to take place. Read again, AT&T has PUBLICLY ADMITTED that eventually T-Mobile’s 3G frequencies will be used for LTE and that people WILL have to replace their handsets. Nice phone, but I’m not eligible for upgrade until December. In the meantime I’m going to wait and see how this merger plays out. David – You down there?? Don’t be afraid to jump on this phone people. It would be well worth owning and using for a good year and a half to two years. And YOU KNOW you will want to get a new phone in 2012 anyway so jump on it! Definitely picking up this phone, sounds like the nvidia is better than the qualcomm dual core. Its because the 8X60 is still Cortex A8, instead of Cortex A9.. Also, Adreno 220 is a bit behind SGX540.. Adreno 300 & A9 should be a big improvement on the 3rd Gen Qualcomm’s. T-Mobile is doing pretty well with getting new Android devices. This, along with the HTC Pyramid, are great choices for Tmo customers. I want the 2X as soon as it’s available. With this merger in the wings, maybe they’ll include a jar of Vaseline. If this was Saturday i’d be hype about what’s going on today but I can’t sorry, they can spin this however they want I’m chillin. Well there’s still punctuation missing all over the place but ok. There is a lot of misinformation going around about the contact/ETF issue, but in your case, if you know that you can cancel and leave after the merger completes, why wouldn’t you sign a new contract for this phone? Next time I’ll type it in Microsoft word and do a grammar check. Lol but Naw I’m good because I thought about it and other people have mentioned it, if for example I get the G2X I won’t be able to resell it because the value will be lost because the radio inside will be obsolete. So basically it’ll be a really good edge phone or a really high tech paper weight. Or a powerful mp3 player.. the power of many in this truly magnificent.. paperweight. Good point movie player and camera as well I guess, I’m still ok though. Seeing the failed specs for the Pyramid I will go with this phone. The G2X completely thrashes anything the Pyramid can do as seen in benches and other areas. So you’ve seen the bench mark tests for the Pyramid? I’m am pretty sure that hasn’t been posted on the web yet. We’re still getting Mr. Blurry Cam photos at best. If there was a Pyramid bench test it probably would have been posted on TmoNews already. I wouldn’t completely thrash the Pyramid yet. People thought the G2 was going to be horrible before it came out because of the 800mhz processor and it turned out to be just as fast if not faster than phones with 1ghz processors. i think there are some test out that some people did. not sure tho. apparently nvidia is coming out on top with these dual core battles. but i duuno thats just word of mouth dont quote me. But we can cross our fingers and hope. @Jeff…..So I am guessing you aren’t waiting on the Pyramid to arrive? 1.2 GHz dual core does sound really good but this has G-Force which I know is awesome cause my mac-pro is running on it. take a look at this. IT was posted in the forums about the Pyramid. From the looks of this if that is really the pyramid, it blows. i would not bet on that. companies never go public on deals that they are not sure will go threw. as for the phone you should buy, its going to take years for att to make any real changes and if you are on contract with t-mobile they cant change anything on your plan( if they do you can opt out with no etf ) . after your plan is up just leave for verizon or sprint. yea, i agree. i was holding out to sign up, now it’s just a waste o cash. fox news just aired a segment talking about att/tmobile . it was mainly about how we would have to switch phones. they made that fact sound like the whole thing was a bad deal. its fox news. they will tell you the sky pink and the ocean is red if it gets them ratings..
News Flash: It’s not only Fox Newsians that are saying its a bad deal. Although I despise Fox News I have to agree with them this time. just like any other network. Selling my rooted Nexus One for this phone. Then in about a year, I’ll sell this phone, rooted, for the next big thing. That’s the way to do it anyway. F a contract. Who’s going to want this phone in a year when it doesn’t have 3g/4G? I congrat Tmobile for finally getting a new high-end mobile. If Tmobile is releasing the G2x on April 20th at $499(plus taxes & fees) off-contract, then that’ll give the purchaser a whopping 10 months to enjoy 3G/4G on it. After that, enjoy the big retro “E” symbol during your AT&T Edge data connections. Sure you can sell the G2x on eBay later. Everyone will be begging for the (DMM)discontinued-mhz-mobile. Anyone want to guess what the $499(plus tax & fees) G2x mobile will sell for on eBay??? An agreement was announced under which AT&T will acquire T-Mobile USA. The agreement is the first step in a process that, including regulatory approvals, is expected to be completed in approximately 12 months. Until then, we remain a separate company and continue to operate independently. We know our customers, business partners and others may have many questions. We will honor all customer contracts entered into before the change of ownership.